Is This The Mercedes SLS AMG Black Edition? Mercedes has put a number of heavily disguised cars through high altitude testing this week outside Denver. Why Is Mercedes&apos; Europe-Only AMG Hatchback Testing In America? While the A45 AMG was one notable car present, another car that may actually be sold in America was spotted as well: an SLS with huge fender flares, manufacturer's plates, and a boatload of body cladding. 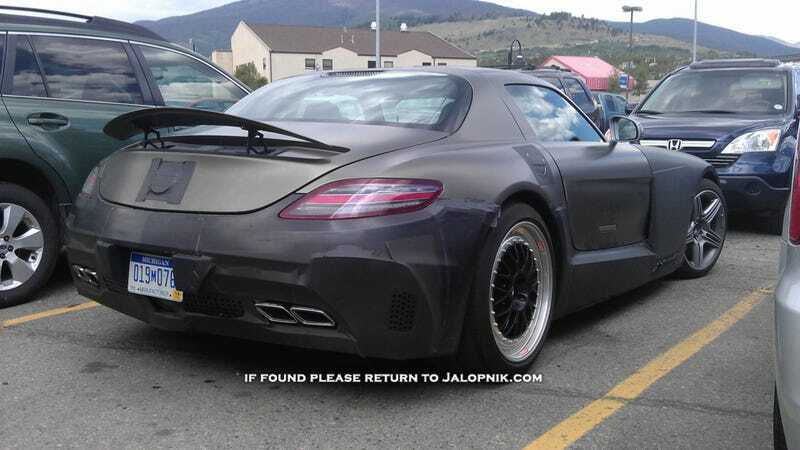 We cannot definitively say that this is the SLS AMG Black and we aren't going to hazard a guess at the specs, either. But, from what we can see, we are able to deduce that this SLS is wider, blacker, and AMG-er than the standard car. Maybe this — and not a Diesel SLS — will be heading to Paris? Hat tip and Photo Credit to Musashi66!